Choosing the right words to search with can sometimes be difficult, especially when you search for information about a topic that you don’t know much about. This can be true regardless of whether you might be searching for information on the gravitational effects of binary stars on each other, or the best way to groom a certain breed of dog, or different approaches for making your own homemade icecream. When you enter some words for your query in a search box, and hit enter, you’ll often see some suggested or related searches in addition to links and descriptions of pages that may be relevant for your search. These suggestions might be at the top of the search results, at the bottom, to one side or another, in the middle of results, or in any or all of those locations. 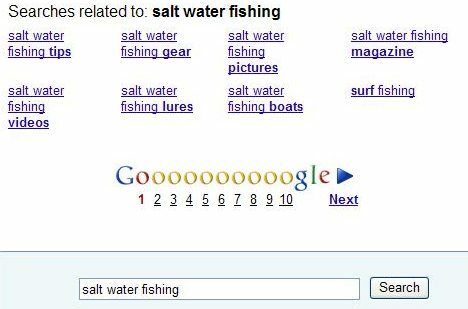 For example, when I search for [salt water fishing] at the major search engines, I see a number of related terms and other suggestions for my searches. Bing displays query suggestions in a left hand column, where you might often find the main navigation on many web pages. Ask.com, in contrast to Bing, shows related searches in a right hand column. If you’re curious like I am, you may be asking yourself how the search engines come up with those alternative query terms. If you’re a searcher, and you don’t know much about the topic you’re searching for, you may wonder if those are actually helpful suggestions. If you’re a site owner, you might be wondering if you should include some information on your site about topics revealed in those suggested searches. A recent patent application published by Microsoft discusses a number of approaches that they might take to decide which query suggestions to present, and how they might present them. It also discusses some of the problems that offering such suggestions might bring. Chances are that other search engines may be using some similar methods, and face similar challenges. Many patent applications start with a description of the problem or problems that they are attempting to address with the methods and processes in their invention. Microsoft’s gives us a couple of issues that they are trying to solve. 3) Avoiding the possibility of distracting searchers, and keeping them from finding information they originally set out to locate. 5) Making sure that the additional information shown – the query suggestions – are actually relevant and helpful. The patent filing gives us some insight into how they might best present and organize query suggestions, how they might focus upon suggesting related words or phrases that are frequently searched for, and how they might provide a wide range of suggestions for searchers to choose from. 5) Describing the relationship between query suggestions and submitted queries to improve the experience of a searcher. 1) A query string and frequency algorithm – Determines query candidates related to the submitted query. Query candidates may be related to the query submitted by the searcher if they contain all of the terms within it. For the related queries, the more frequently they appear, the more relevant they may be considered. 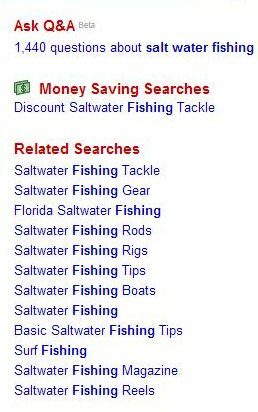 For example, if my search terms are [salt water fishing] and the query term [salt water fishing Florida] is fairly popular, since it contains all of the terms in my search, the search with “Florida” added to my terms may be identified as a candidate query if it shows up in a lot of searches in the search engine query log. The focus of this algorithm is on how frequently these queries show up in searches. 2) A query log session algorithm – This algorithm also looks at query logs, but it looks for other search terms that may have been used in the same query session. If many people who search for [salt water fishing] also look for [surf fishing] in the same query session, that may be considered a good candidate query suggestion. This algorithm may also look at those related key phrases and look at search results associated with them, and attempt to extract key phrases from top search results from those queries. The focus of this algorithm is to find relevant query suggestions that “reflect[s] the search intentions of the user.” This approach means that query suggestions that may not contain the original query terms may be suggested. 3) A search result content algorithm – Search results are looked at for the query term, and key terms or phrases may be extracted from those. This approach may be used when there isn’t very much data in the query logs to use with the first two algorithms, and is independent of information found in the search engine’s query log files. 4) Functional or semantically similar suggestion cluster terms. 3) Have high-frequent terms or phrases of the top search results. Related Searches – are searches that are considered the most relevant frequently used search queries for the search term that a someone searched for. In Google, you often see these at the bottom of your set of search results. Most searched – are relevant query terms and phrases that are the most frequently used (as opposed to the most relevant). These tend to be placed at the top of search results – if they are a better match for what a searcher is trying to find then the original query used, a searcher doesn’t have to scroll through search results before being offered these suggestions. Refine by Searches – these are intended to narrow and focus the original search. A search for [salt water fishing] might be refined by offering a query suggestion for the more narrowly focused search [salt water fishing Florida]. Expand by Searches – These have the result of expanding and broadening a search. A search for [salt water fishing Florida] might be expanded by offering a query suggestion for the broader search [salt water fishing]. “Also try” searches – Related queries that contain no or only part of the original query. For example, a search for [Derek Jeter] might return an “also try” query suggestion of [Alex Rodriguez] since the two are well known team mates and are often mentioned together. [Prada Culture] devil wears prada, herzog meuron. This kind of organization through clustering is intended to make it easier for a searcher to understand the query suggestions, and why they were offered. The patent filing points out that it might be convenient for mobile searchers if a search engine offered query suggestions in a drop down under the search box as a searcher is typing in their query terms. The idea behind this is that it means that a searcher may have to do less typing on keyboards that may be harder to use than those found on desktop and laptop computers. Of course, the major search engines are now offering this type of auto completion of query terms for all searchers, and not just mobile phone users. Suggested searches for related and frequently appearing queries are shown to searchers with the intention of making searching a better experience for the people who use search engines. The patent application describes three different algorithms that might be used to identify query suggestions, but doesn’t go into much detail how they may be ranked against one another. There’s some suggestion that how frequently they appear may be part of that determination, as well as another approach that sees if they provide a range of meanings and intents that may be associated with a searcher’s query. Query suggestions may be purposefully presented to searchers in different parts of search results based upon the type of suggestion. Suggestions that may be offered based upon popularity, or frequency of appearance, may be presented at the tops of those results so that a searcher doesn’t have to go through a page of search results before seeing them. Suggestions that are based upon relevance and relatedness may be presented at the bottom of search results to provide a searcher with alternatives that might not take a searcher off in too different a tangent as the suggestions shown at the top of the results. Have you been seeing more query suggestions in your searches? Do you find them useful? What do you think about where they are placed on a search result page? Very interesting. More than once I’ve catalogued related searches across the top three engines in an attempt to uncover keywords overlapping in the engines’ related queries, and determine if these are useful subsidiary optimization targets. More often than not – unsurprisingly – the answer appears to be yes. However, sometimes related query suggestions are clearly based on semantically- and/or structurally-related content associated with the original query, rather than any sort of associated query. In this query for “hottest toronto band” the related searches are virtually exclusively related to a single post from a site that ranks well (usually first) for this term, as this indicated by this screen shot. So there are potential perils involved in blithely optimizing for related terms. Reading this post made me wonder if Google’s “Wonder Wheel” is simply related queries that have been presented graphically. Little doubt that the answer is yes, at least based on your sample query, as these stitched-together screenshots illustrate. This is something that’s fascinated me. Something a lot of people aren’t aware of that Google’s now let loose is the new option (available in “Show Options…” at the top left of the search results) for the “Wonder Wheel”, as Aaron mentioned. It will show related terms, available for exploration. I think this is how broad match in Google AdWords is connected to other terms, but beyond that, I believe the Wonder Wheel is simply Google allowing some of the Algorithm out a bit for exploration. How exactly the terms are interrelated is something that they still have not openly discussed. But the Wheel is a bit fun to explore. Thank you for your thoughtful comment. Some very nice exploration of the potential usefulness and limitations of query suggestions as possible resources for keyword research. Your screen shots comparing wonder wheel results with related search suggestions do show a strong connection in that example. We don’t have access to the search engine query log files that the search engines do to use something like the “query string and frequency algorithm” or the “query log session algorithm” that they may be using to find query suggestions and related searches, but we can look at search results for specific queries like they do in their “search result content algorithm.” It can be interesting to even look at what kinds of terms and phrases appear in a search results page for a particular query when doing keyword research. Your point about related queries possibly being taken from a single page is a good warning about relying too much upon the related searches and query suggestions that might show up with search results. Interesting that the collection of terms was so limited in that example. Exploring those new options, including the Wonder Wheel has been interesting, and fun. I’m wondering how much use they are getting by searchers. It is a chance for Google to experiment with some different algorithms. I guess we can’t expect them to be too transparent with aspects of the different searches that they provide within the different options, but it would be interesting to hear more. in Google, the suggestions you mentionned in the first picture appear at the bottom of the page which may make me suppose that it is a “spare part” in case we don’t see anything compelling to click in the previous 10 results. But because of the golden triangle fact, are they actually clicked? Bing may do a better job in this case as well as the other search engine. The place where you put the suggestion may have heavy consequence on sponsored listings. When you are performing a task, attempting to find an answer to a question, and none of the search results that you see seem like they will answer that informational task, it’s possible that one of the related results at the bottom of a page might. The Microsoft patent provided some different reasons for including some query suggestions at the top of results, and others at the bottom. If a suggestion was different enough from what was presented in the actual search results (and very popular), presenting it at the top of the results would keep someone from having to scroll through those results if one of the suggestions at the top was a better match for what they wanted to find. Presenting suggestions that were more “related” or relevant, and possibly not as popular means that if the search results weren’t quite a match, then those additional (and less popular) query suggestions at the bottom of the page might be fairly welcome if someone made it that far without seeing a result that appeared to satisfy their informational needs. One thing I do find interesting is that it’s a Microsoft patent filing telling us of good reasons to include some types of query suggestions at the tops of results, and other types at the bottoms, and it seems like Google is following that approach for the reasons cited in the patent filing while Bing is instead showing query suggestions in a left sidebar. It is possible that the placement of query suggestions may have an impact upon sponsored listings. I would also think that If a query suggestion was very helpful, that the ads shown with that new query would be a better match for a searcher. A lot of interesting thoughts and tips. It is truth that search engines are huge and sophisticated machines that use advanced applications and “intelligent” programs to give the best results available. But also every search engine is different and uses different algorythm, so it is important to use for example the most popular (Because the biggest number of web adresses is stored there – and the biggest chance of hitting what You seek). I know that there are many reasons to use othere search engines but that is something that nobody is mentioning as far as I see. Any of them is perfect and still the SEO is so important in making a site popular and recognizable. I don’t know is it good or wrong, but surely it is some kind of reality that we live in. Web marketing become huge branch and I wonder how far will it go. It is great that the search engines provide these patents that divulge their information, and even better that you help interpret it for us. Microsoft has actually made a decent attempt to create a unique and powerful application. So these patents are already incorporated or pending implementation?